It is a fantastic way of playing with unique ways of building your army. You do not even need to go anywhere near Matched Play points here. 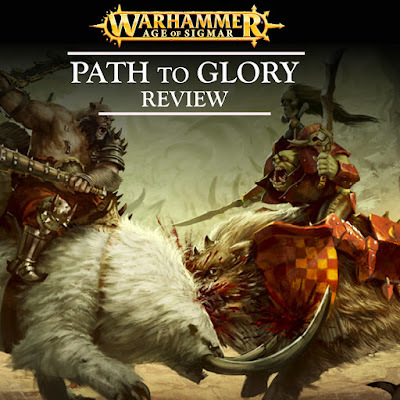 You will have seen in the Battletome's recently and also the Generals Handbook, Path to Glory has been present, but until now, you have not been able to play with all Factions, only the new releases. 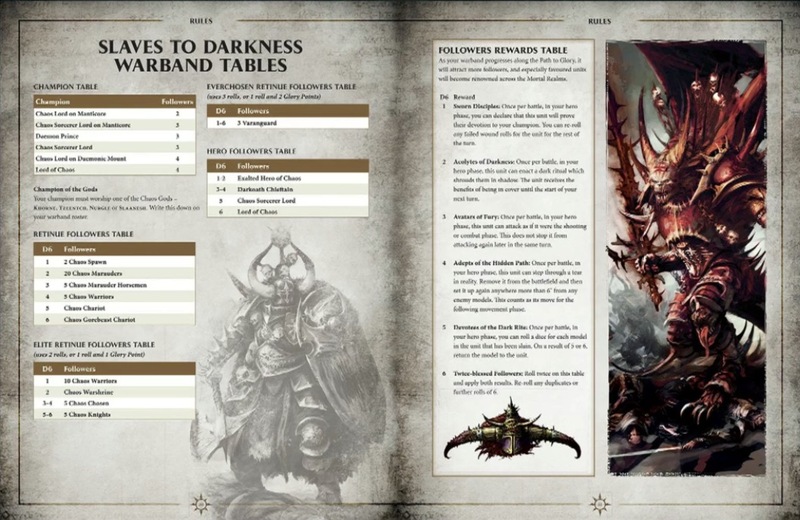 This book now gives you the option for all current models with Triumph Tables plus options for building your Warbands up, as well as this you also get new battle plans to play through a campaign, or continue on your Skirmish warband. 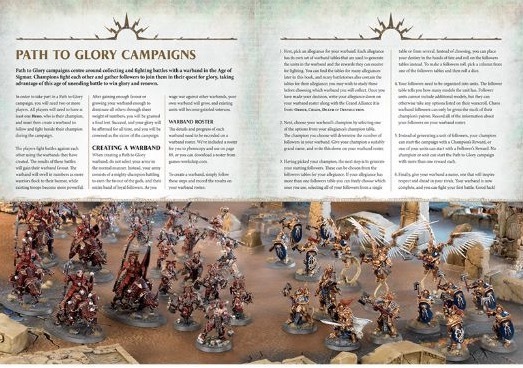 This was the whole idea, you have begun last month by building up your Skirmish warbands, by the time you finish that campaign you should be in a position to have a starting Path to Glory force. Brilliant for continuing on your warbands story. So whats in the book! 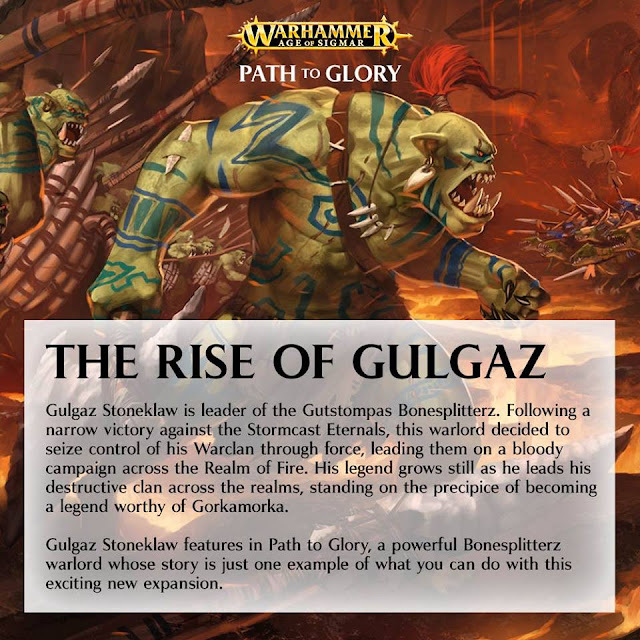 The story is short one but really gives you the flavour for what it is all about, it follows a Bonesplitterz Big Boss, Gulgaz as he begins his uprise in the Mortal Realms. He does not only attract followers of Bonesplitterz, but of Troggoths, Beastclaw and more too, this sets the scene for how you can play Path to Glory, you do not need to stay with your own faction, sometimes this is benefitted by some unique rules but for the most part, you can pick from the tables within your alliance. The story is left to be picked up further if need be, but also gives you a little more background to AoS. 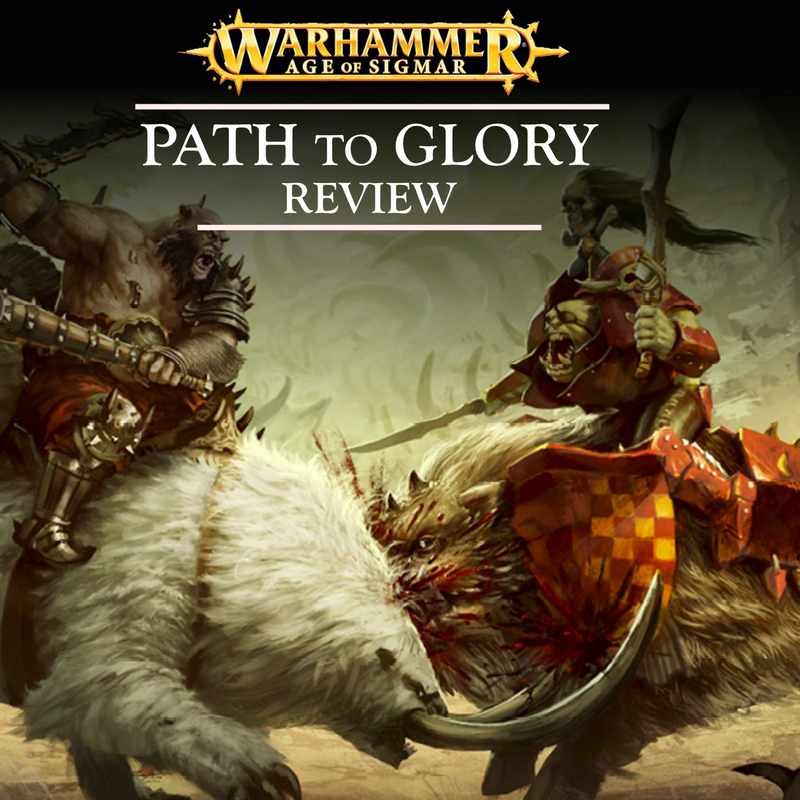 So, the point of Path to Glory is that there is no points, instead you pick units from the warband tables and build your army that way. It allows you to either roll or choose or even sacrifice rolls for more units and instead gain glory points. Glory points are the way to win a campaign, well it used to be the only way. The book does contain another way now of winning the campaign. You begin by selecting your General and then next to the general is the amount of units or rolls you can start the campaign with. This number depends on how powerful your general is to start with (A Frostlord doesn't get any rolls). There is a number of battle plans, 7 in fact, in the book you can either play through or use independently, the battle plans work really well within the campaign especially if you have just 2 of you taking part. But they do also allow for more. 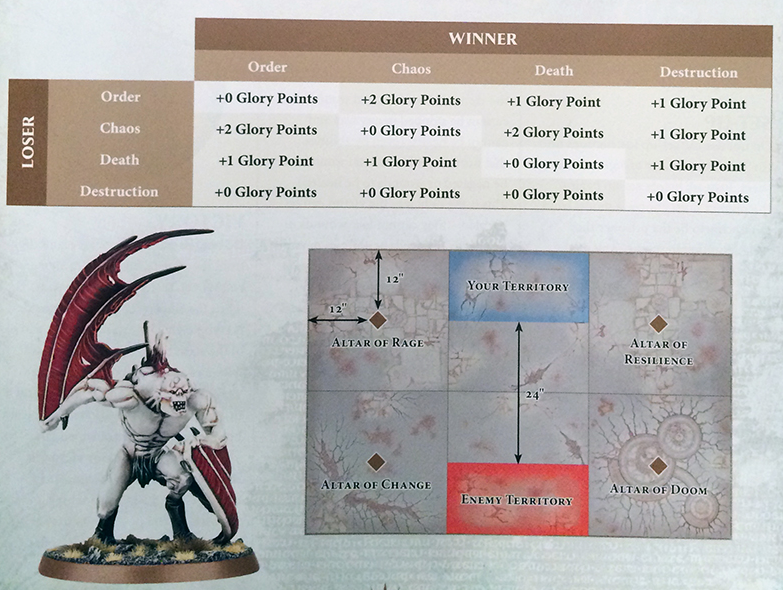 2 of the battle plans you would have already seen in Generals Handbook 2016, the others are new. 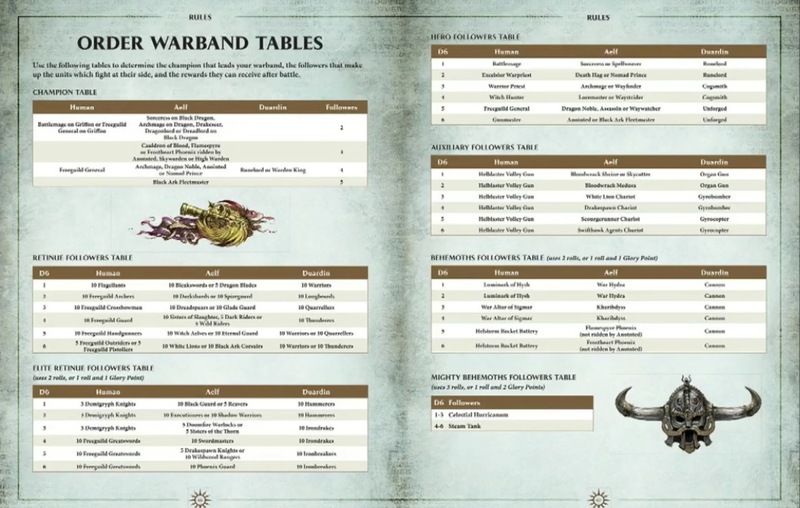 This is the main part of the book, this is where you find the tables to roll on the choose new units, the tables for the rewards of battle etc. There is many tables with all current ranges of units covered, this includes all units within a battle tome and all units in the Grand Alliance books also. Some like the Order table are pretty vast, allowing you to choose between Aelf, Human and Duardin. This overcomes the fact some of the factions are tiny, it was something i employed when writing my tables last year. This also means you can freely pick units across the board if you like as well. 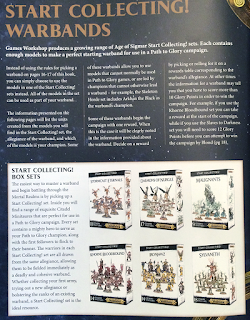 Seraphon get their won tables in this book also. Death is of course the smallest faction at the moment, but there is still all the options you need. Flesh Eaters get their won, but all others are combined. If you wanted to run a pure Nighthaunt warband, that is fine. 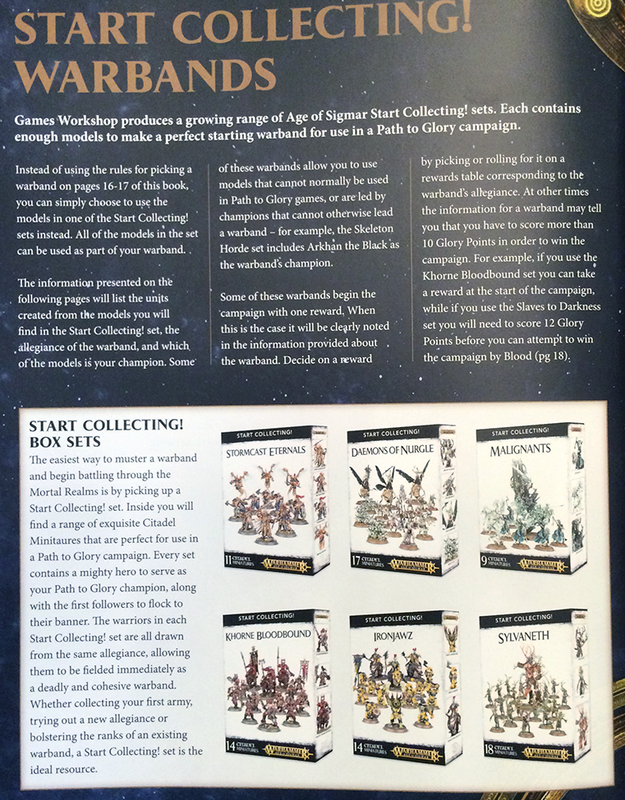 There is also a great little part where it explains about the Start Collecting sets and how they are perfect for starting a warband, it also goes one further and gives you restrictions or boons if you decide to buy a box and use that as your starting warband. This could be needing to gain more glory points or starting with more glory points from the beginning. All in all, this is just plain cool. If you wanted to play more narrative games but don't know where to start, this is it. Start here. I shall be using the tables heavily in my upcoming Narrative weekend Event. The idea of growing your army in this way is exactly what got me into wargaming in the first place. Over the next few weeks, I shall be beginning a campaign down the club and playing through the battle plans and reporting on them here. 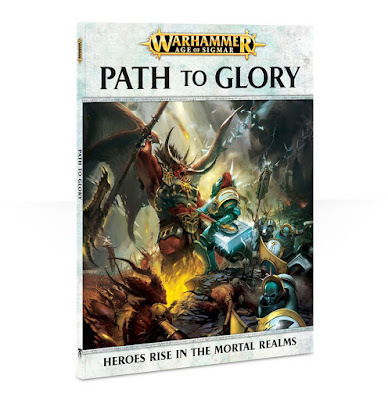 The book is priced at £20RRP (Cheaper if you click the link below) and worth every penny, preorder now and let your Hero rise in the Mortal Realms!